Well, Chevrolet had us going pretty well since, until now, we didn’t really have an idea what the 2016 Chevrolet Camaro would look like, even with the various teasers handed released over the last few weeks. But now, merely one day before the highly-anticipated official debut of the 2016 Camaro, we have the car we’ve been waiting to see. 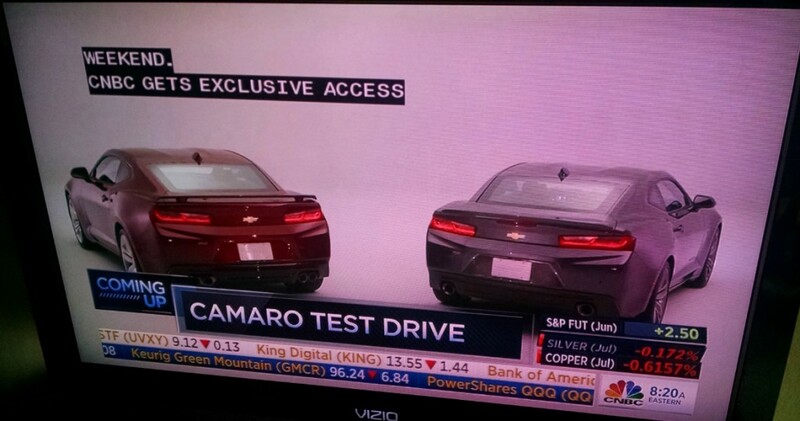 CNBC has leaked three photos of the 2016 Camaro, showing the front and rear ends of the sixth-generation model. Surprisingly, the leak isn’t the internet’s fault… for once. In the photos, the 2016 Camaro is shown completely uncovered, showcasing a massive new lower grille and LED day-time running lights in the front. In the rear, it’s easy to see the C7 Corvette cues Ed Welburn, GM’s design head, said would be sprinkled throughout the entire Chevrolet portfolio. The finer details, along with being able to see the 2016 Camaro in person, will still be shelved for tomorrow’s debut at Belle Isle in Detroit. But, we do know the SS variant of the 2016 Camaro will feature standard Magnetic Ride Control with selectable settings plus the 6.2-liter LT1 V8. Plus, the car will weigh at least 200 pounds less than the fifth-generation model while featuring a 28 percent stiffer body structure. This is your new Camaro, muscle car fans and sports car enthusiasts. We’ll have the latest information on the 2016 Camaro as it is properly unveiled tomorrow. In the meantime, we’ll take in what we see here. Looks very good! Beats Ford! I is hard to tell much by these. The rear corner does have a sharp edge and that is a very important aero tool. I expect the car will have a good CD number. All that hype for something so plain. I hope it outperforms the mustang but based on looks the new mustang wins by a landslide. Fingers crossed these are not real images. Since no SS badging is visible I guess these are 6 and 4 cylinder models. The SS body should look much more mean. Your right my mistake. That’s a horrible spot to place a badge. Evolutionary not revolutionary is what it looks like and that’s fine by me because the Camaro always had the best you could ask for in the styling dept. Really don’t like the new design. The round hood, the plain rounded front end, the weird crease in the back bumper, the odd-shaped and plain rear lights, plain rear end, etc.- even though GM wanted to keep it evolutionary, they could have done some really cool design changes with this car and didn’t- really disappointed. Looks like they are trying to sell more Camaros to the general public and ladies. Maybe it will look better in person or better yet, this is a just a prank and the REAL version will be shown on Saturday. If not, better hurry and get the 2015 model before they are gone. This has to be one of the most bungled, idiotic press launches of a new model/refresh in the past 5 years. Grainy images of the vehicle from hideous angles, shown briefly on a single network that averages about 30k viewers in any given hour? Plus a picture of the car’s vaguely changed, bare metal body — without any parts attached? What is wrong with GM? Why do GM managers always screw up? I think these are fake. If you take a look at the sheet metal cut out of the rear tail light and match it up against these 2 vehicles they don’t match. Angled vs straight. Hey I’m as big a GM and Camaro fanboy as the next, but lets be real. I see nothing to get excited about here. Just a scaled down and refined 5th gen, fortunately the handling and performance will be better. On second thought, These pics are hideous. The angle isn’t complimentary, nor is the lighting such that you can really tell what was changed. The cloth draped profile shot from the GMAuthority reveal story reveals a more pronounced hood to rear deck ratio as well as a more aggressive roof treatment. It’s still obviously evolutionary, but maybe the magic is in the details and proportion shifting on this new 2016 camaro….I hope.